Everyone’s always talking about how your Home, Services and About pages are critical website real estate for your business. However, if you’re using these pages to convert, clear calls to action on those pages will lead to your Contact page. It is your Contact page that often leads to your first contact with a prospective customer. Make sure you put your best foot forward by creating the perfect Contact page. Did you know that the Contact page is one of the most-visited site pages for most companies? Because of that, your Contact page deserves the same love and care that your other pages receive. And it is essential to include the following elements on your page. Answer This Question: Why Should I Contact You? Why should that potential customer contact you? What’s in it for them? Start your Contact page by answering this question simply. Quickly describe what problem you can solve in exchange for your prospect’s information. Your contact form should be short while still gathering important information that will help you identify who’s contacting you. Long forms will turn your visitors off to contacting you at all. In fact, forms with over six fields only have a 15% conversion rate. Keep it simple! Although the contact form is important, you should include other methods of contact. Add a contact email address and a phone number for those who need information fast. Plus, visitors like to have options. You’ll also benefit from adding your social media accounts to your Contact page. This way, visitors are able to engage with you outside of your website. Even if your visitor doesn’t want to complete your form, they should still have a next step that keeps them perusing your website. Clearly tell them where to go next by adding a call to action. Your website visitors—current customers, potential customers, employees, referral partners and more!—are looking for your Contact page for a reason. Perhaps they need your number to call to pay a bill. Or perhaps they don’t want to sift through a ton of copy to find a form or a phone number. Either way, showcase your Contact page instead of hiding it. Placing your Contact page link at the bottom of their website. For visitors who are looking for a quick way to reach out, this is inconvenient. 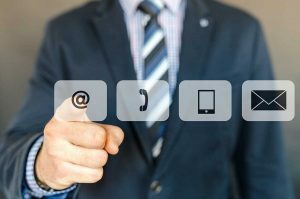 Give your visitors the best experience by keeping your contact information front and center, easy to reach. The best bet? Top, right-hand corner of your website’s design. Need Help Building a Contact Page for Your Business? Is your business website in dire need of a new and improved Contact page? We’re here to help! Reach out to Iceberg Web Design today to get your project started. Give us a call at 763-350-8762 or send us a quick message. Learn why we rank so well, and find out how we can put your business on top. Iceberg Web Design is a website hosting and custom responsive website design company in Minneapolis, Minnesota and Anoka, MN. We have been working with business owners and individuals since 2005 providing unique, professional websites at affordable prices. We work one-on-one with customers throughout the United States and Canada. Our corporate office is located in Anoka, and we have offices in Minneapolis, St. Paul, Chicago and Toronto. We are available for in-person consultations in these areas. Website design, content, layout, and graphics © 2005-2019 Iceberg Web Design. All Rights Reserved.